The ninth meeting of the ADPWC was held in Manila, the Philippines on November 16, 2017. 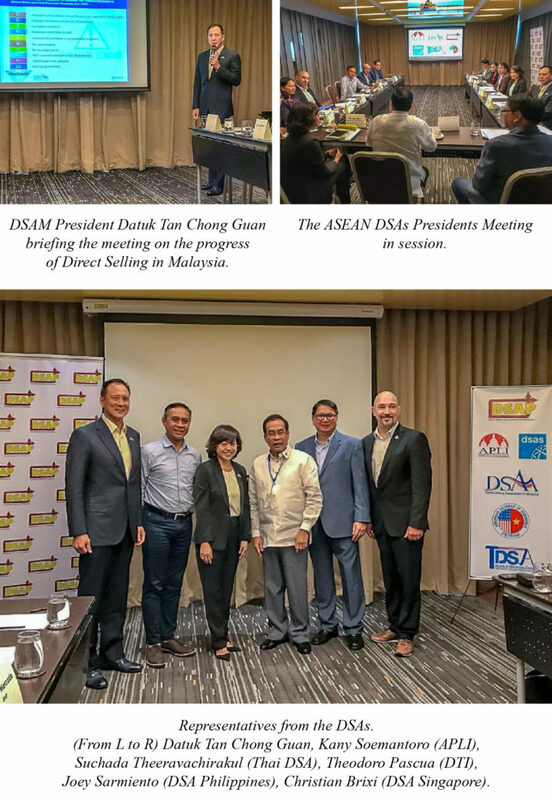 This meeting was attended by representatives from the DSAs of Malaysia, Thailand, Singapore, Indonesia, and host, the Philippines. Teodoro Pascua, Head of Consumer Protection Group and the Undersecretary of the Department of Trade and Industry (DTI), the Philippines was the special invited guest. Pascua was briefed by the respective countries on the progress of Direct Selling in each country and the containment of illegal and pyramid schemes. Later, Thailand presented the updates of the latest amendments to their Direct Selling laws and a brief overview of the recently concluded WFDSA World Congress in Paris. The meeting also congratulated Thai DSA for being chosen as the host of the 2020 WFDSA World Congress. The next meeting will be held in Singapore in the second quarter of 2018.